Click on 'Add a coupon' - you will then get a prompt to enter the code. If successfull, you will be able to see that a discount has been applied. Check the total cost - this is what you will be charged once you Continue to the payment. Be sure to read over the Terms and Conditions - we cannot issue refunds on the basis that a coupon code was not entered. How do I enroll online? You will now see a list of the courses. Click on the check box of the course(s) you wish to enroll into. Scroll down to the bottom of the page and then click the 'Continue' button. If you haven't already logged in, you'll then need to either log in or create an account. Make sure that you enter your email address correctly, as this is the only way we have to contact you! On the summary page, read over the Terms and Conditions, If you have a "coupon code", you can click the "Add a coupon" button to apply it to your order here. Click "Continue". You'll now be taken to our secure payment gateway. Follow the instructions on screen and it will step you through the payment process. The account you create with Health e-Learning is your key to your courses. It lets us know that you're who you say you are, and that no one else is getting the courses that you've paid for! We're sorry to be pestering you with these questions, but on the up-side, it's a once-off process that only takes a minute to complete, and it gives you access to the Health e-Learning forums, resources and courses. 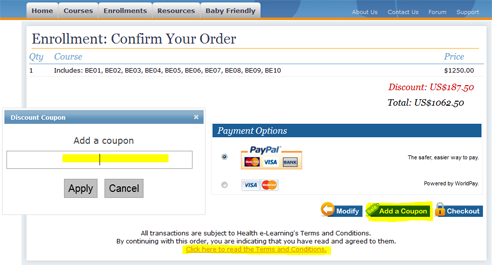 Health e-Learning will never spam or use your details inappropriately. How long will it take before I am enrolled in a course and can get started?